On Thursday, January 31, the Munich 1 Regional Court had bad news for Qualcomm's eight patent suits (over four different patents from the same patent family) against Apple's Spotlight search. A few hours later, and a day after its most recent quarterly earnings call (a type of event around which Qualcomm likes to announce court filings), Qualcomm shared with a couple of news agencies a motion for contempt sanctions it brought against Apple in Munich. That contempt motion relates to a pair of injunctions granted to Qualcomm in December without an actual finding of infringement (announcement; impact assessment; defendant's dilemma). Qualcomm is angry because the iPhone 7 and 8 remain widely available in Germany (which, based on my online research, is still the case today). The appeals court (Oberlandesgericht München = Munich Higher Regional Court) confirmed in early January that Apple had appealed the injunctions. The appeals court furthermore confirmed that Apple had brought a motion to stay enforcement (pending the appellate proceedings). At the time, Qualcomm had not yet responded to it. I'd be surprised if we didn't hear about a decision during this month of February, however. Qualcomm obtained a preliminary injunction barring Apple from telling the media that the iPhone 7 and 8 remain available in Germany at more than 4,000 points of sale. Now Qualcomm has brought a motion for contempt sanctions, giving rise to contempt proceedings. The patent-in-suit is being challenged by Apple and Intel in an opposition proceeding before the European Patent Office. The EPO Register indicates that oral argument has been scheduled for May 24. A panel of three examiners (chairman: Manuel Pavón Mayo; 1st examiner: Ali Hijazi; 2nd examiner: Thomas Agerbaek) will hear the parties and, typically, render a decision (which will be appealable) at the end of the day. According to news agency reports, the contempt motion seeks to hold Apple responsible for the fact that the iPhone 7 and 8 remain widely available in Germany, asking the court to impose a significant fine or, in the alternative, imprison the CEOs of the defendant entitites (including Apple Inc. CEO Tim Cook). Some German-language media reports have focused on the question of whether Tim Cook is at risk of being imprisoned. He is not. Even if the court were to hold Apple in contempt (we'll get to that in a moment), it simply wouldn't happen. There's always some ignorant, incompetent and lazy journalists reporting on such cases. The first part means that the CEO will be imprisoned if the contempt fine can't be collected ("as a substitute" in a scenario of default). Based on Bloomberg's quote from Qualcomm's press release, it appears that Qualcomm sought fines. Theoretically, this also means that the CEO might end up behind bars, but only if the fine isn't paid, and we all know Apple would pay if it had to. The second bullet point relates to extreme cases in which courts have imposed multiple fines (which get ever higher) and a company still fails to comply. In that case, a CEO might be imprisoned even if a company was ready, willing and able to pay a fine--because the court would determine that fines won't do the job. But no court would ever consider this when the first allegation of non-compliance is brought, and that's why I can't imagine Qualcomm would have proposed that kind of sanction. Again, Qualcomm's statement to the media doesn't suggest that Qualcomm even tried to persuade the court to skip the step of a contempt fine and go straight to imprisonment. Therefore there isn't even a need to talk about why there is no possibility of extradition. So, practically, the question is whether Apple would be fined. The media reports are unclear. One of them refers to some iPhones still having been available in early January "in Apple stores," which may or may not refer to the official Apple Stores (with a capital S). Should that have been the case, it would likely have been an oversight in one or more of the 15 German Apple Stores. Any related fine would be small. But Qualcomm appears to primarily--if not exclusively--complain about Apple not having complied with its obligation to recall the iPhone 7 and 8 from its German resellers. I heard Presiding Judge Dr. Zigann's announcement of the recall order live in court on December 20, 2018. I remember that the word "seriously" was mentioned in connection with Apple's obligation to ask resellers to return the banned products, and that there was the usual boilerplate in German recall orders about the defendant having to make sure resellers would get their money and any shipment costs back. On ipwiki.de, a German-language IP-focused Wikipedia-style reference, it is noted that the recall obligation means the defendant must request that its customers return the banned products, but whether those customers comply with the request is their decision and cannot result in any liability on the defendant's part, provided that it has made reasonable efforts to call on its customers to return the banned products. Basically, Apple's resellers (the major carriers and retail chains) are treating Qualcomm like your average patent troll. There have been other smartphone patent injunctions in Germany that resellers simply didn't take seriously. Instead of fearing that they might themselves become the target of patent infringement actions, resellers tend to just keep selling products while there is demand. A German publication for the retail channel, Absatzwirtschaft, reported in early January on the implications of the relevant pair of injunctions. The article quotes me several times. It contains screenshots that show how some resellers were actually alluding to the injunctions in a humorous way (which obviously isn't funny if you're Qualcomm and just deposited $1.5 billion to enforce that pair of injunctions). 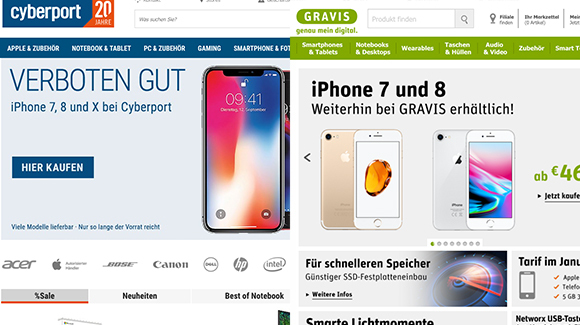 A reseller named cyberport (link to screenshot) described the three banned iPhone models (7, 8, and X; though Apple had already discontinued distribution of the X some time before) as "verboten gut," a German saying that literally means "prohibited(ly) good," which means "too good to be lawful" in the sense of "extremely good." This actually shows there was quite some awareness of Qualcomm's position that those products infringe (though Qualcomm apparently wasn't sure of its position; otherwise it would have allowed the court-appointed expert to look at Qorvo's chipset schematics, which Qualcomm had actually obtained for that very purpose in a U.S. discovery proceeding. I guess Qualcomm's contempt motion is going to result in either no fine or in a small fine (assuming that Apple will have done what it's required to do under the law, which is to make a "serious" request that resellers return the related products), and then I wouldn't be surprised if Qualcomm at some point started suing Apple's resellers, though the problem for Qualcomm would be that the most important resellers are major carriers and Qualcomm wants to work with carriers (as some Qualcomm witnesses explained at the FTC v. Qualcomm antitrust trial in San Jose that ended a week ago). Time is not on Qualcomm's side. The appeals court might stay enforcement, and/or the EPO might revoke the patent-in-suit.